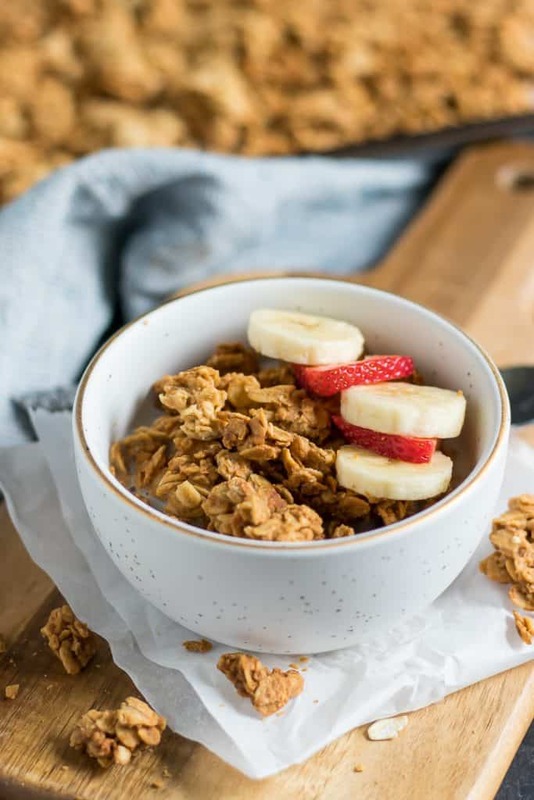 Big, clusters of crunchy peanut butter granola make this hearty granola the perfect addition to any snack, yogurt bowl, smoothies and more. It’s so simple and perfect straight from the jar as well! Early this week I mentioned I am focusing on recipes that are super simple and as little sweat for you as possible. If Monday’s Simple Slow Cooker Shredded BBQ Chicken wasn’t easy enough, then this peanut butter granola will definitely be at least 10 times easier. You toss it together, stir and bake. Boom. That’s it. I promise you can surely handle this one. Bonus? You probably already have everything you need in the pantry to make this. I don’t know about you, but having to go to the grocery to grab ingredients I don’t have is a huge hassle especially now that I have a baby in tow on these errands–it’s not a quick in and quick out at all. The past few weeks or so, I have been on a huge yogurt, fruit and granola kick. I have been having it for a snack or breakfast for the most part. Buying granola is not the most budget friendly so I started making more of my own. Peanut butter granola was one I hadn’t made successfully before so I thought I would give it another go. I love, love LOVE my granola in big crunchy clusters. If you lived with me you would probably get annoyed with the fact that I pick out all the clusters from the package before anyone else gets a chance. It’s how I do ice cream as well–there is a reason people eat cookies and cream and cookie dough ice cream–the chunks! And the bigger the better. So as if this is not enough peanut butter on its own, I have actually been having yogurt topped with fruit and granola and then a big spoonful of peanut butter as well–never can you ever have too much in my opinion and thankfully our little (big) 9 month old son is the same way. The addition of flour in this recipe helps bind the granola a bit more so that it will form into more cluster like pieces. 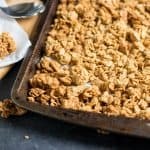 The addition of an egg white is another way to add some extra crunch to your granola but I found that this recipe was fine without it. Cooling it for a good amount of time without touching it helps with the crunch too. 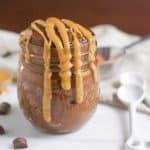 If you are a peanut free house, almond or cashew butter should work great. For nut free, sun butter should be okay as well. As for the oil in this recipe, I would stick with melted coconut oil or canola oil for the best flavor. If you don’t prefer the flavor of coconut then either skip it or use refined coconut oil. Other than that, enjoy this crunchy goodness and happy snacking! 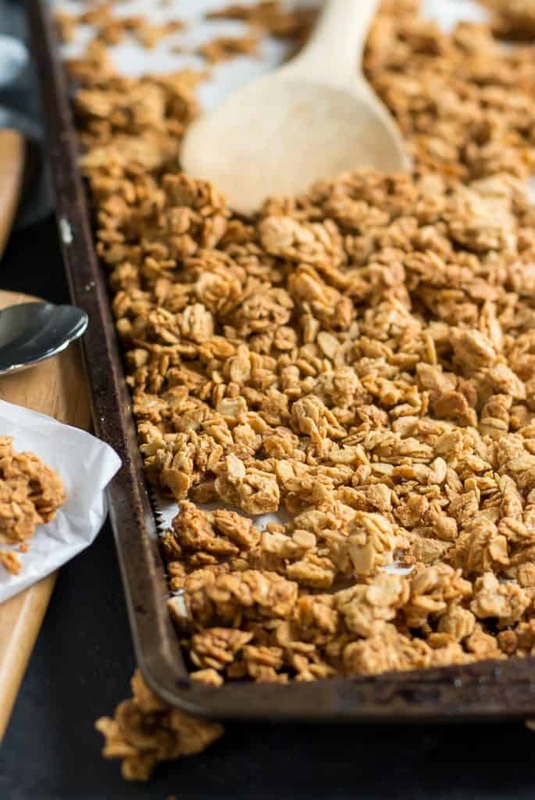 Banana Bread Granola – need I say more? In a medium bowl, combine all ingredients and stir well to combine and coat all of the oats. Spread evenly on a parchment lined baking sheet. Bake for about 25-30 minutes, or until golden brown. Allow to cool in open air for at least one hour to allow for the most crunchy clusters. Store in an air tight container. I LOVE easy and healthy granola. 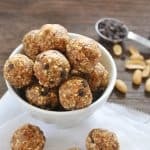 Love how easy is this one to make and not as many ingredients! Peanut Butter Granola??!! I need thisASAP!! I think I have all the stuff to make it already. Can’t wait to try. Yay! Isn’t that the best when that happens?! Super simple!!! Love making homemade granola because its so easy and always tastes better than store bought!!! Yum!!! You had me sold at PB!